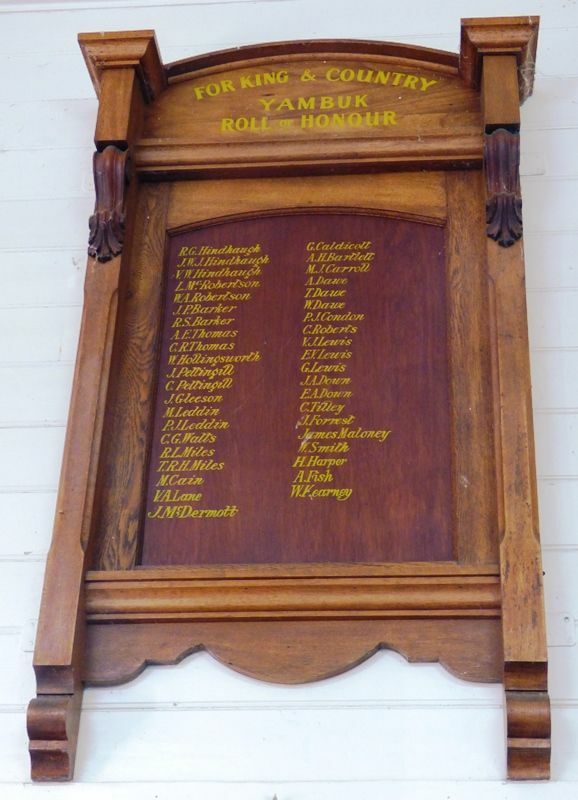 A wooden honour roll commemorates those from Yambuk who served in World War One. On Friday night last a very large assemblage of people gathered at the local Hall to be present at the unveiling of the Honor Board. Mr D. Carroll addressed those present and in a few well chosen words voiced the feelings of everybody in his admiration of the boys who are fighting for King and Country, and also those who have fallen. He asked those present to stand and sing the National Anthem after which a programme of patriotic items were rendered by the following State School Scholars; Master M Barker, Miss Thomas, St Joseph's School, Miss I Robertson and Miss M Barker. Mr Carroll (on behalf of the people of Yambuk) then asked Mr H .S. Bailey, M.L.A. to unveil the Honor Board. Mr Bailey thanked the committee for having honoured him by asking him to perform this duty, and spoke in glowing terms of the manner in which the Yambuk boys responded to the call of the Motherland. He then unveiled the Honor Board and read the 36 names thereon; of those who enlisted in Yambuk, and several who were natives of Yambuk and enlisted elsewhere. Supper was then served by the ladies after which a few hours dancing was indulged in by the young people. Port Fairy Times and Macarthur News (Vic), 25 October 1917.